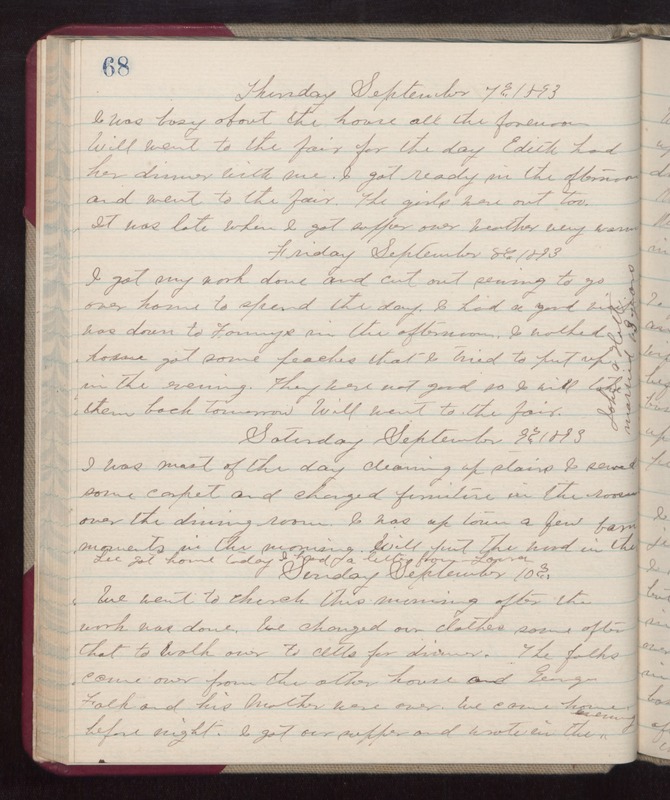 Thursday September 7th 1893 I was busy about the house all the forenoon. Will went to the fair for the day. Edith had her dinner with me. I got ready in the afternoon and went to the fair. The girls were out too. It was late when I got supper over. weather very warm. Friday September 8th 1893 I got my work done and cut out sewing to go over home to spend the day. I had a good visit was down to Fannys in the afternoon. I walked home got some peaches that I tried to put up in the evening. They were not good so I will take them back tomorrow. Will went to the fair. John & Hatt married 13 years. Saturday September 9th 1893 I was most of the day cleaning up stairs. I sewed some carpet and changed furniture in the rooms over the dining room. I was up town a few moments in the morning. Will put the wood in the barn. Lee got home today. I had a letter from Laura. Sunday September 10th 1893 We went to church this morning after the work was done. We changed our clothes soon after that to walk over to Otts for dinner. The folks come over from the other house and George Falk and his Mother were over. We came home before night. I got our supper and wrote in the evening.